Dogs Bite Decatur Al: STICKNEY IL - A 12-YEAR-OLD GIRL AND HER SISTER WERE WALKING HOME FROM THE SCHOOL BUS STOP WHEN A NEIGHBOR'S PIT BULL BEING WALKED BY "A BOY AND HIS SIBLINGS" LATCHED ON TO HER FACE AND "DANGLED"
STICKNEY IL - A 12-YEAR-OLD GIRL AND HER SISTER WERE WALKING HOME FROM THE SCHOOL BUS STOP WHEN A NEIGHBOR'S PIT BULL BEING WALKED BY "A BOY AND HIS SIBLINGS" LATCHED ON TO HER FACE AND "DANGLED"
A walk home turned into a frightening experience for a 12-year-old girl in the Chicago area. 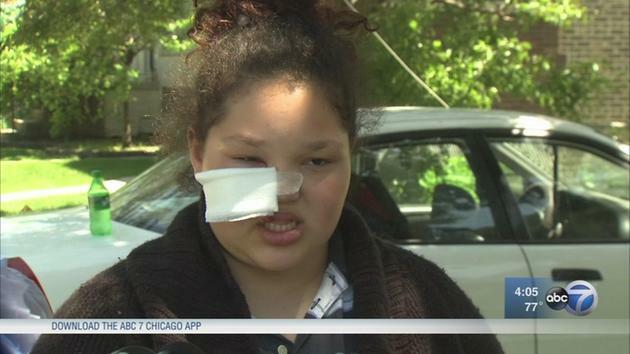 She was attacked by a PIT BULL as she was walking home in suburban Stickney on Wednesday. Brianna Hull-Saunders was walking home with her sister from the bus stop after school when the attack happened. She had to get nine stitches after the attack. "I'm terrified. My heart hurts for her. It's hard for a mother to talk about it," Kimberly Hull-Saunders, Brianna's mother, said. The grade-schooler said trouble began near 40th Street and Wisconsin Avenue after they encountered a neighborhood boy and his siblings walking their family's dog. She said it was as the boy, who they know from school, taunted them with the dog that the animal somehow broke free. "The dog was too strong. The leash slipped out of his hand and the dog jumped at my face," Brianna said. Brianna's 11-year-old sister, Brittany, somehow managed to fight the dog off. "HE WAS DANGLING ON HER, so I slapped him off. And then he was on his hind legs and then I slapped him off again and then he got off," she said. The girl's family says she almost lost sight in her right eye and now has to have plastic surgery once her wounds heal. "I'm very angry. This shouldn't happened to anybody," Theodore Saunders, Brianna's father, said. It's unclear if the dog has been quarantined as police continue to investigate. "We have some people who have said we've had issues with this dog jumping on people or nipping at people," Stickney Police Chief David Babich said. For now, Stickney Township Animal Control has cited the owner for allowing the animal to run around loose and not having a dog license. Nutters are notorious for having unlicensed and unvaccinated pit bulls. What does that say about pit bull owners? They can't handle the basic requirements of dog ownership. That's why they abhor breed specific legislation. They would not be capable of adhering to rules and regulations. It's called responsibility and nutters are allergic. It's not safe for anyone to be outside anymore. Hell, the freaking pits are invading schools and jumping onto school busses to attack.